Classic Brands Hercules Universal Heavy-Duty Bed Frame is a heavy-duty metal black bed frame that can be adjusted to fit Twin, Twin XL, Full, Queen, King, and California King mattress sets. The interlocking frame system requires no tools and can be assembled in minutes. The bed frame has seven legs for additional support and locking wheeled rug rollers, so the mattress can be easily moved and locked into place. The Hercules Universal Heavy Duty Adjustable Metal Bed Frame with Double Center Support Bar and 7 Rug Rollers with Locking Wheels fit Queen, Twin, Twin XL, Full, Full XL, King and Cal King Size mattress sets. 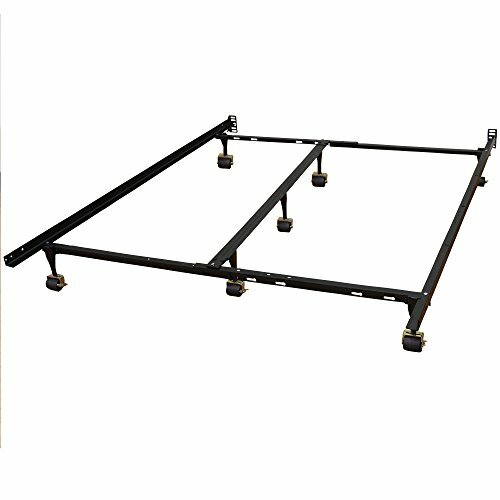 This solid black matte powder coated steel bed frame is engineered to support heavier mattress sets and feature adjustable sliding end rails. The extra-strength double rail center support bar adds extra support to your mattress and box spring in the middle to prevent sagging. Many manufacturers warranties require a center support frame. The center bar is extra wide at 2 ¼ Inch-for extra stability. 7 rug rollers make moving the mattress easy and all the wheels lock into place to prevent further movement. The sturdy side rails keep your box spring in place, so it cannot shift during use. Interlocking frame is easy to assemble in minutes and no additional tools are required. An additional extender bar is included for the King and California King sizes. Seven legs with wheels make moving your mattress simple and each of the rug rollers lock into place to prevent your bed from moving. Classic Brands Hercules Universal Heavy-Duty Bed Frame is backed with a 3-year worry-free warranty. 7-wheeled legs with locking rug rollers so frame and sleep system can be moved easily and locked into place.